If her mother could see her now, she thought. 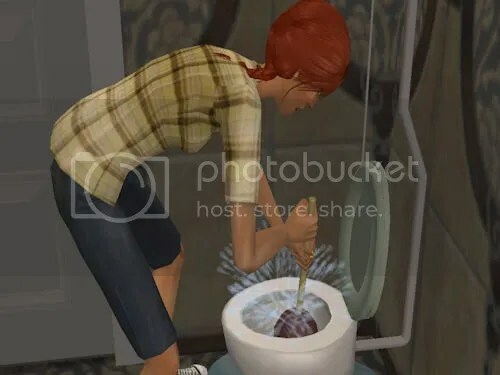 Plunging toilets, toddler lunch down her shirt, gardening, sewing, cleaning house. Is there anything she doesn’t do around here? She chuckles to herself as she continues plunging. “How many times do I have to tell them to not use so much toilet paper?” She asks herself out loud. “Next time, they can do this themselves.” She says this every time, but has yet to enforce it. She’d never be able to find the culprit in this mad house, and it’s not worth her energy to try. Her saving grace for the time being was her properly named daughter, Grace. She was back home after her first year at Business College. Nicole knew she could count on her lending a hand without complaint, she sure missed her oldest daughter this past year. For more than her help around the house, and with the toddlers. Grace was her first and encompassed the beginning of this wild journey of motherhood. To think her daughter was in college made her feel old, not that the toddlers didn’t help with that regularly. Downstairs, the three oldest McCarthy kids were watching a movie. They were possibly more excited to have Grace home, than Nicole was. “I really don’t get this movie, why are we watching this?” Emma asked, her face turned in confusion. “Have you decided where you are going to college yet?” Grace asked. It wasn’t a new subject, and Emma was in summer school to bring her D- grade up to a C level, or she wouldn’t even have the option of higher education. “No.” She scrunched her nose. She didn’t want to think about any of that stress. The discussion of school wasn’t a table friendly conversation. Emma was in private school, but was barely getting by with her D-, while Oliver was quite studious, and was rejected from the school. He blamed Emma for her bad grades, and Emma blamed her parents for overworking her with the toddlers. She used to be a good student, better than Grace even. Before the sun has a chance to rise, the house begins to stir. The twins, Elias and Julius like to be up at 5am, and Zilla followed shortly after. It wouldn’t matter if no one was awake though, Grace would be up getting ready to jog; she had to jog. After her kidnapping, her parents had bought her Murphy to protect her on her jogs. Murphy suffered without Grace in the home, he hadn’t bonded with anyone else in Grace’s absence. She wouldn’t admit it outloud, but Grace was pleased. She had been concerned that he wouldn’t miss her. “You stinky boy, you’ve been pestering the skunk again, haven’t you?” Murphy looked up at her with his puppy brown eyes, then whimpered in excitement. He loved to run. “And me of her,” Grace said, and she meant it. Zilla was from their father, not from Nicole. The entire thing was hard to explain, or believe, and for the most part the family lied. It was hard on Emma to bond with her, but Grace had no issue. After all they were still related. Dr. Russo mentioned an eye surgery when Zilla was in kindergarten, it would make her appearance more normal. Finn and Nicole were planning to leave it in Zilla’s hands to decide. With Grace back home, Oliver had more free time. Eagerly he checked out books from the library, then dived into them, finishing whole novels in a day. He missed reading this past year more than anything else. He also found he could invite friends over to the house again, since Murphy stopped peeing everywhere. His Mom had said he just missed Grace, but an entire year of avoiding pee puddles was enough to drive the sympathy away from any man. Paloma walked over regularly, and they would escape to the orchard. She had moved from South Port to Millwood during the school year, and an instant friendship had formed. His Mom looked at him with doe eyes, like he was going to marry Paloma, but he didn’t think of her like that. Sure he knew she was a girl, and she was pretty, but she was Paloma. His Mom didn’t get that explanation, but she didn’t get a lot of things, the way he figured. “I can’t wait to grow up and have a baby. I’d never tell my Mom or Grandma that, they’d freak out and lecture me how I don’t know what I’m talking about. But I do. I help care for Linnea as much as they do, and Mom has Grandma helping her too.” Paloma mused, mostly to herself. “Maybe one is easy, I don’t know anything about one baby. But three toddlers is not easy.” He didn’t understand her obsession with babies. He was more fond of them then his big sister, Emma, but he wasn’t anxious for fatherhood. This was another reason why his mother just didn’t know anything. Girls were weird. He felt Paloma was too young to be obsessed over babies. He had enough on his plate with his siblings, private school rejection, and getting good enough grades to hopefully have a future someday; he was no where near ready to be thinking about his own kids. One of the many reasons Oliver avoided the house at all costs, was Emma. She would complain that her spirits were low, and other such nonsense. Emma laid on the sofa, dominated the living room, controlled the tv, and wouldn’t allow anyone on the computer without annoying them with her huffing. Her family prompted her to get out, to call Jim to go on a date. They didn’t get that she didn’t want to start anything, with anyone. Her life was too messy for a relationship. Men just needed too much attention, like grown up babies, she thought in her head. She smiled at her own cleverness. Grace tried helping her, but she wasn’t any use. Grace had never had a boyfriend, kissed a boy, or really hit it off with any that well. Grace, as awesome as a big sister as she could be, didn’t have any clue about boys. She could hear her mother and Grace cleaning up dishes from dinner, and though Emma was raised to be helpful, she just burrowed herself into the sofa even more. “I really appreciate your help.” Nicole said sincerely. “I know. What can I say, just me, being awesome.” Grace teased. I’ll get the second part posted tomorrow, with this many people in a household, it’s hard to keep it short. Poor Oliver really wanted to go to Private school, and even with that score he was rejected. 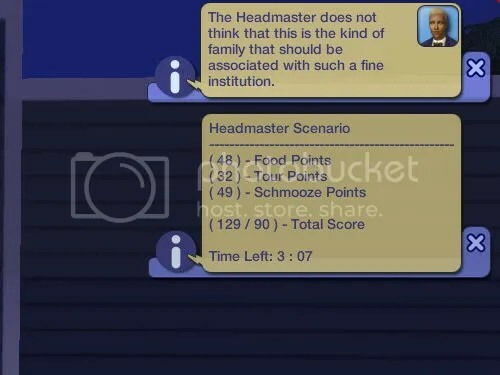 Apparently the headmaster thought the house was too chaotic, or he really did judge him based on Emma, who is in private school and doing horribly. Grace hasn’t had any kind of relationship with boys. She has a few one bolts in her panel, and two three bolts, but they are Grant and Merrill Millett, both very much married, not to mention that Merrill is in his 50’s. They have WAY too many kids! Let me tell you. I don’t think I’ve ever played a house with so many, I can’t even begin to imagine the next generation. Good old Finn wants 6 grandkids, so if each kid has one, he gets that LTW. The story of Zilla. In short, they wanted another kid, I thought, c’mon you have three. But okkk, you can try once. If it is meant to be, yada yada. They got pregnant, with twins. I was like WHAT! But fine, whatever, that happens in life. Before they get pregnant with twins, Finn gets abducted by aliens. This isn’t new for me. What is… well the fact that I’m on a different lot and checking something the ACR, and get the option to scan for pregnancy… huh *blink* these people shouldn’t be pregnant… OH my stars! It was Finn, and with TWINS. Seriously, I was about to have FOUR brand new babies, this family is poor, chaotic, and hard to run as it is (while fun and challenging), I couldn’t even imagine twins. I had never had a sim get pregnant from abduction (I knew they could), and as I didn’t play with anything supernatural, I just clicked a few buttons to pretend like it never happened. But instead, it became one baby. Little, crazy eyed, Zilla. I decided then, to let go of my supernatural rejection temporarily. Afterall if it became too bad, or green, or really scary, I could adopt it out, and pretend like it never happened. But Zilla grew on me, and the rest of the family (minus Emma) like her quite well. See, super short explanation. whew! Poor Oliver – his mum has his life all planned out for him at the age of 12! I have never had that happen with the headmaster! Maybe it’s an AL bug or something? I don’t know if I’ve tried the headmaster since AL so it’s just a guess. Or maybe it’s just a random weird glitch. I was wondering what you meant about Zilla’s eye operation! I figured she was just unfortunate looking – I didn’t realise she was part alien. Did you write that in or are you just pretending she’s odd looking? The only thing I could think of with the headmaster is that they had a messy house. I know I’ve had him drive off right after stepping out when the yard work was bad. But he didn’t just run off this time. Maybe he didn’t like all them toddlers. Zilla has those GIANT eye balls. Her skin, nose, and all of that seem perfectly fine, just really big eyes that are don’t fit her head. All of the alien/abduction happened before I started the blog, so most of the story line there is in my head, and how I figured they would have handled a man giving birth. Wow, this is a huge family. I totally love Oliver. He just seems like a cute teen. or at least a very sensible one. But I’ve known real girls like Poloma. Yikes! I was very curious as to how this family has toddlers. What a story! XD Geeze, isn’t that always the way? I usually love twins, but they come along in the house I usually least want twins. I love the supernaturals. But haven’t had any alien births. I’d love to see Zillah. That’s a great name by the way. I’ll have to get a picture of Zilla, I can’t believe I didn’t get a good one of her. I was happy she came out with normal skin, nose, and all that. Just giant eyez, the better to see with, so I hear. I’d be scared to give her babies though, might be green, with tiny nose. Lunar, your vampire story, makes me want to play a vampire. Do you play with all the supernaturals? I’ve known girls like Paloma too. Trouble, trouble. I’m curious how she will be when she’s an actual “teen” might bump her to independent teen to see what kind of wants she rolls then, just for curious sake. 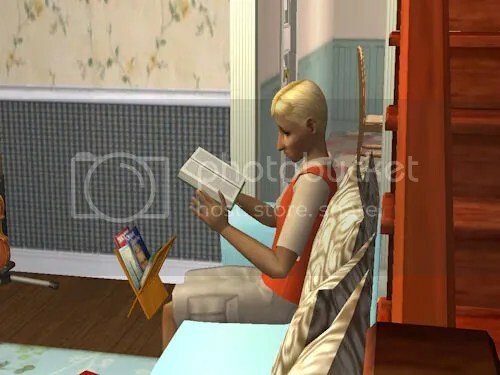 I heart Oliver too, in TS3 he’d be this nice, bookworm. But Emma! she’s great. I love an attitudinal teenager, lol. 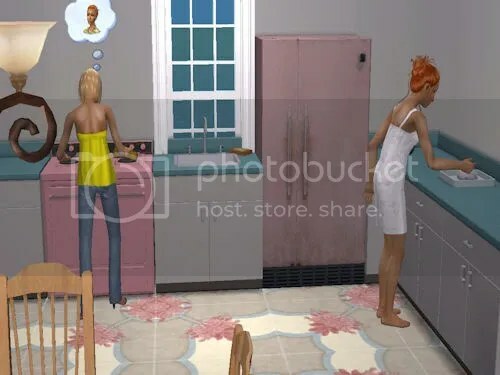 How funny would it be if she had to work as like, a barista or something her whole sim life? Grace… you’re in college. You need to get a boyfriend! And so true when Oliver was like mom… she Paloma. I can’t date her. I have some girl friends who are just meant to stay in the friend zone. Ugh! Yes, that happened with the Shazad twins-above the necessary score, but no entrance into private school. I might try again since the twins are older now…maybe it’s a one time glitch. That household was very quiet though-at the time it was only the twins-no toddler running about, everything was clean, but they did live in an apartment. Oh such a hectic household! For sure, biggest family I’ve ever had! Not likely to happen again anytime soon ether.